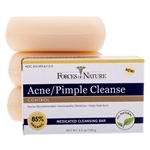 Clears acne, pimples, and blackheads fast! Helps restore skin back to a healthy state. Be smart about how you treat your body. This product is Certified Organic. 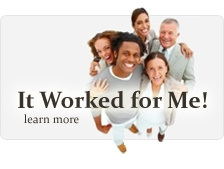 This is proof positive it contains no toxins, chemicals or pesticides. When you are treating any ailment the last thing you want to do is expose your body to any chemicals as this further stresses your system. 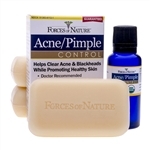 Clears acne & blackheads while promoting healthy skin. 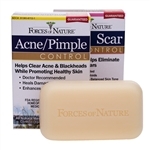 Healthy, acne-free skin with natural acne-pimple control! Acne is a skin condition that occurs from overproduction of oil (sebum) by the oil glands of the skin. Although acne is often associated with teenagers, it can affect people from ten to adults well into their 40's. Women often develop acne in their mid to late 20's, even if they never had breakouts prior. 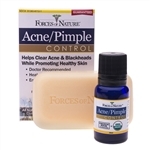 Acne can appear as whiteheads, blackheads, pimples (zits), pustules or cysts. As such, acne treatment procedures are varied, and there are many ways that you can get rid of acne, from acne home remedies to natural acne treatments that work in blackhead removal to clear up your skin and get rid of pimples. Acne occurs wherever there are overactive oil (sebaceous) glands on the skin. This oil (sebum) is a natural substance for lubricating and protecting the skin. When overactive oil glands produce too much sebum, it blocks the sebaceous gland openings, causing an oil buildup underneath. In turn, this oil stimulates an overgrowth of bacteria. Although acne is not caused by a bacterial infection or poor hygiene, a bacterium makes the situation worse. The bacterium Propionibacterium acnes (P. acnes) is a normal part of the skin's surface, protecting skin from harmful bacteria invasion. But when there is too much oil, the P. acnes grows inside the blocked pore. Once inside, P. acnes produces chemicals altering the sebum's composition. This irritates the skin and causes inflammation. Inflammation near the skin's surface produces a pustule. Deeper inflammation results in a papule (pimple). Even deeper inflammation results in a cyst. If the oil accumulates melanin (pigment that gives skin its color) or becomes oxidized, the oil changes from white to black, and the result is a "blackhead." Contrary to a common myth, blackheads are not dirt caused by poor hygiene. The three causes of acne are excess oil, clogged pores, and bacteria. Choosing cosmetics that do not clog pores, cleansing pores regularly to prevent oil buildup, and maintaining a healthy diet all contribute to acne reduction. Some believe genetics, stress, hormone fluctuations, certain foods, or drugs may exacerbate acne. Although they may see an increase in acne outbreaks, none of these factors are proven to cause acne. 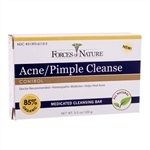 The good news, though, is that homeopathic remedies can go a long way when it comes to treating acne. Acne products and acne remedies that are natural and safe in that regard are very beneficial for people to not only treat acne, but keep the skin healthy in doing so. When it comes to knowing how to remove blackheads, make it a point to seek out natural acne treatments and cystic acne treatments. They are often times much easier on the human body and much more benign on the skin, allowing you to get rid of everything from back acne to blackheads on the nose or other areas of the body. Over time, and with good skin care, you can prevent acne and keep your skin clear, healthy, and more.